We all know renovating an old building is super exciting and you can’t wait for every riveting twist and turn about Gramp’s window restoration, or how I’ve been stalking old school houses and dragging my feet sending in Part 2 of our National Register application. The drama is real folks! It’s been so long since I’ve written a post that I asked followers on our facebook page what they would really like to hear about. Here’s the answers to your burning questions! Old Schoolhouse at Lavenlair Farm in Whitehall, NY Their school has a dirt floor and very high ceilings, it was originally a church! What made you want to buy the school house in the first place? Me: “Gramp Made Me!” The family history is very important to me but my short answer is “Gramp made me do it!” I have a hard time making decisions. 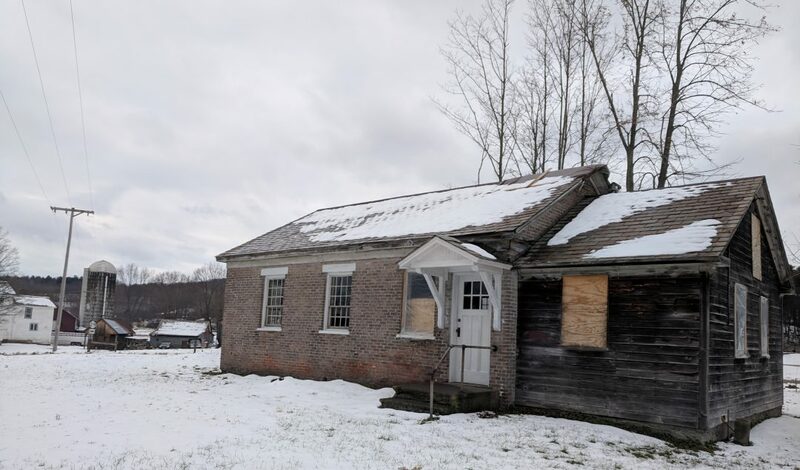 We first started talking about the school house in March of 2017, we looked at it over the summer, we looked at it some more and did some research. It got to be the end of summer and it had been on the market almost a year at that point. Gramp started calling and emailing me about the school house every day. To say he was lobbying for it is putting it mildly. Finally he said “Jill if someone else buys it and you drive by and see that person working on it how will you feel?” That did it. We wrote an offer. Note from Jill: This backfired because now all we do is talk about it! What’s been the biggest struggle so far? “TIME!! !” If Gramp and I had our way we be school house 24/7, 365! I know the to-do list will never end but there are so many things I could accomplish if I just had more time. I need three me’s: one me to work on the school house, one me to take care of Philip, and one me to do everything else! Gramp just put the first reglazed window back in the addition, it looks great! Do you have the history of the school, all the teachers and student names? Me standing where we think the students once were! Have you decided the plan/final usage? We are making decisions daily over here! Here’s the floor plan from when we bought the school house and the proposed new floor plan. We are planning a one bedroom, one bathroom, single family home that will be a vacation rental. Our goal is to finish it in October of 2019. We’re closing things up for the winter right now. We plan on going strong March – September next year and being open for business in October of 2019. Previous: Previous post: Gramp’s Old School Celebrates One Year Anniversary! What an adventure you are on. I’m so enjoying following you with all the ups and downs. The house is looking great! I definitely agree with Gramp (my brother) that the kids are in front of the school house, notches to notches!! He’s convinced it’s the schoolhouse!